DIY Home Decor is a fantastic and fun way to fill your space with your personal style! 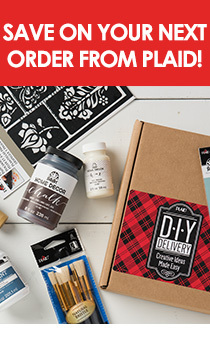 With countless project ideas and comprehensive tutorials featuring high-quality products such as FolkArt Home Decor Chalk and Mod Podge, you'll be ready to transform your home. Before you start your next FolkArt Milk Paint project, make sure you consult our free crafting eBook, the Ultimate Guide to Milk Paint! Download this free craft eBook to transform your decor with these fun, trend-inspired painting projects for your home. Master FolkArt Ultra Dye and energize your home decor projects with bold, vibrant color in this free crafting eBook! Learn a technique to create a chippy layered finish using FolkArt Home Decor Chalk and our tools. Faux Finish Techniques: Realistic Moss & Concrete! Concrete and moss are such hot trends for interior and home decor, and you can now DIY the same look for a fraction of the cost. Donna Dewberry teaches you how to create a chippy layered paint finish using the FolkArt Home Decor Wood Layering Block! Read this article to learn how to use our collection of hand-lettered inspired stencils designed by Lily & Val. See the most current color chart for Delta Ceramcoat Chalk paint. See the latest color offering for Fabric Creations Plush Fabric Paint by downloading the latest color chart. See the current color assortment for Fabric Creations Soft Fabric Ink by downloading the color chart.